Scrap elemental analysis can be performed by a variety of approaches. Hand sorting, a simple method for separating alloys by grade and arguably the one that is in greatest use today, is a rather inaccurate process and subject to human error. With the plethora of technological advances in X-ray fluorescence (XRF) spectrometry analysis techniques, the opportunity to recover nonferrous, low-grade scrap by sorting metals into various alloys with high accuracy exists, thus all but eliminating sorting errors. 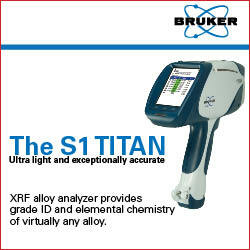 Send us your questions about scrap elemental analysis using the Bruker S1 TITAN! Each year, industries in the United States discard millions of tons of nonferrous metal alloys as waste since the metals are either uneconomical or impractical to recover using hand sorting. Most alloys downgrade in value because of contamination that cannot be removed in a cost-effective manner. Additionally, the United States ships nonferrous metal alloys worldwide, namely to China, for the low-cost labor and the task of separating these metals into higher-value scrap grades vis-à-vis sorting and visual identification. Historically, the recycling and/or metals industry has been moribund businesses, reluctant and slow to adopt new scrap elemental analysis technologies. XRF technology, however, is poised to transform this industry by shifting it from archaic methods of visual identification and handpicking to a highly efficient and fully automated sortation method and materials handling system. This move will be twofold: XRF spectrometry has boundless benefits for the scrap industry and provides spillover benefits. For instance, industries utilizing scrap materials can acquire scrap at lower prices, and industries generating scrap can sell scrap material at higher prices due to increased quality. For that reason, agencies of the United States government such as the National Science Foundation and the National Institute of Standards and Technology are aggressively funding new technology to advance the scrap processing technology. Handheld spectrographic analyzers, a relatively new introduction to the scrap sorting and recycling market, utilize X-rays to generate elemental information from an unknown sample, accurately obtaining an identification of the choice alloy under consideration. For scrap elemental analysis using XRF analysis, the technician places the analyzer on top of the sample, or the sample on top of the analyzer, by picking up the choice scrap metal and pushing the instrument against the surface of this sample. The time needed to develop an accurate spectrum ranges from mere seconds to one-half minute. Then, the operator reads the output on a built-in, user-friendly screen on the face of the instrument. Bruker S1 TITAN scrap elemental analyzers are notoriously adept at determining high Z metal elements – or elements that are high on the periodic table – and heavier elements. Advances over the last decade, however, make. handheld XRF particularly useful in scrap elemental analysis, even for lighter elements including aluminum, which have low characteristic energy levels. By contrast, other techniques like chemical analysis are far more time-consuming methods of analysis. Unlike XRF spectrometry, chemical analysis more accurately displays a litmus test than a quantitative analysis. While chemical analysis kits are readily available, the process leaves a massive margin for human error: the operator must guess the type of alloy being considered and apply drops of chemicals onto the surface of the sample. By comparing the reaction and color to a table of results, the operator bases conclusions on the change in coloration of the chemicals. This method of scrap elemental analysis is not only time consuming, but requires significant scientific experience in the evaluation of the various chemical reactions. Still in use today, the Institute of Scrap Recycling Industries must provide courses to teach operators and scrap dealers how to apply chemical analysis to the sorting of nonferrous metals due to the complexity and specificity of the process. Versatile test equipment, capable of solving multiple analytical needs with one method. Minimal operational and upkeep costs. Lower acquisition cost when compared to other scrap elemental analysis technologies. Maximize profits through state-of-the-art accuracy. Near instantaneous results in a matter of seconds, depending on the specific application and sample. Relatively simple technology that requires simple operator training to take measurements quickly and accurately. No shipping of samples, thus eliminating the cost and hassle associated with laboratory testing. Increased production output and turnaround. Lower long-term costs with a swift return on investment. Option and ability for quick quality control. If scrap recovery is to continue to be a long term and successful business, the shift from hand sorting and destructive chemical analyses to XRF techniques for scrap elemental analysis is paramount. Connect with us to find out more about the Bruker S1 TITAN for your scrap sorting needs.